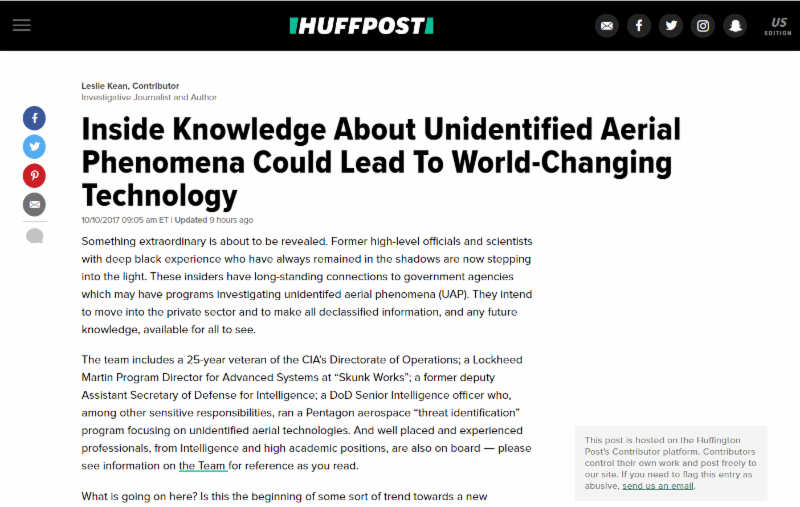 Author/researcher/musician Tom DeLonge reentered the Disclosure process in a big way in mid-2016, stepped back after the November election, and has now come forward with a significant announcement as described by Leslie Kean in the 10/10/17 HuffPost. PRG applauds DeLonge's successful efforts to interface with Pentagon officials and top scientists with classified status. Clearly something very important is developing. 3) to the extent the political media is involved in ending the truth embargo, trust in the media will also increase. There is a price being paid for each day the truth embargo on the extraterrestrial presence remains in place. Seventy years on - 26 years since the end of the Cold War - we are still paying that price.